In the recent tutorials, it has been underlined that iOS 7 has brought along great new features. 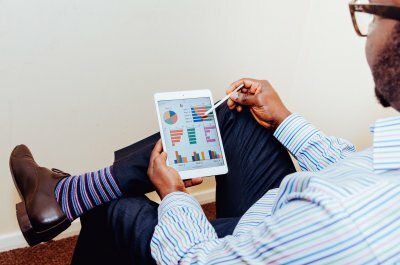 Many new frameworks, libraries and APIs have been exposed to developers, letting them create modern and engaging applications and attract more users. One of them is the UIKit Dynamics library, integrated right into the UIKit framework, allowing the implementation of real physics in the most simple manner ever possible. UIKit Dynamics is a brand new library shipped in iOS 7, and to those who haven’t used it or ever read about it, it might sounds hard to work with. However, the truth is totally different, and through this tutorial I’ll make an effort to present how easy it has been done to add realism to an app without having deep knowledge of physics, math and of course libraries or frameworks like Core Animation. People who have already worked with such technologies, they’ll find UIKit Dynamics a really handy tool, as it takes away all the hassle and effort that was just described. UIGravityBehavior: It’s name says it all. 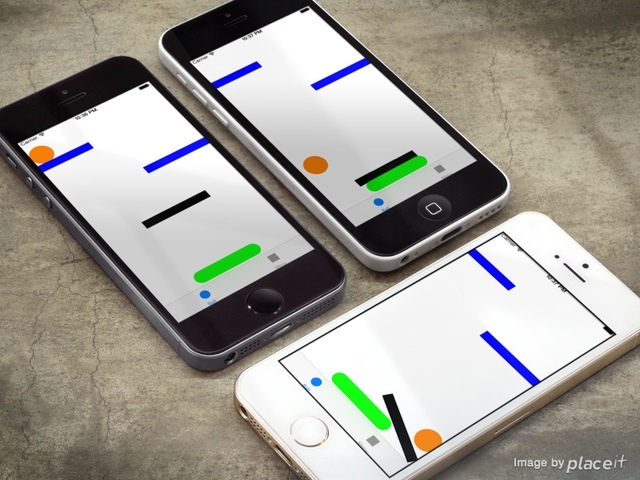 The UIView objects that is applied to gain gravity attributes. UICollisionBehavior: It provides the ability to two or more view objects to collide, or between a view object and a boundary (such as the screen bounds). UIPushBehavior: It applies a force (in other words an acceleration) towards any direction to one or more view objects, and it supports two modes: The continuous where the pushed object gets its speed gradually, and the instantaneous where the object is pushed at max speed at once. UIAttachmentBehavior: It is used to attach a view object to another, or a view object to a point. UISnapBehavior: Using this class, a view object can animate like it is magnetized from an invisible magnet existing to a specific point. More than that, it contains a damping property, which can be used to make the object bounce around the point that it will finally snap to. elasticity: It’s value ranges from 0.0 to 1.0 and it specifies how elastic a collision between two objects or an object and a boundary will be. density: This property represents the mass of an object. The greater its value, the bigger the object’s mass. resistance: Using this property, the damping of an object’s velocity can be modified. friction: With this one, the friction between two view objects can be set. angularResistance: It’s used for damping the angular velocity of an object. allowsRotation: This BOOL property can be used to specify if an object should be rotated or not. I guess that it would be pointless to note that you should not worry in case all these seem too strange to you. As you’ll see along this tutorial, using the dynamic behaviors is easy enough and just a matter of a few lines of code. Anyway, at this point our brief introduction to the UIKit Dynamics has been concluded, so we can move forward to the really interesting stuff. As always, I encourage you to visit the official documentation and do an extra reading there as well in order to get a deeper understanding on this topic. For now, come along to explore some of the new great features that the UIKit Dynamics library offers! As always, we will implement a sample application to demonstrate the UIKit Dynamics essentials. Through it, you’ll see the basics you need to know so as to start incorporating some nice effects in your applications. 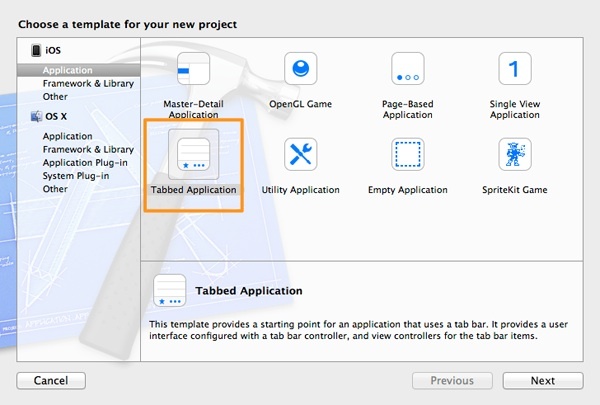 So, first of all let me tell you that our app will be separated in two parts, therefore we are going to create a Tabbed Application with two tabs. In the first half of it (or in other words in the first tab), we are going to see how UIKit Dynamics actually work using some of the classes described in the introduction. Every object in this part is going to be kind of UIView class. We’ll start by creating a simple view with round shape just like a ball, and we’ll see how gravity affects it once it get applied to it. Next, we’ll continue by trying out collisions, so we’ll watch our ball bouncing just before it finally sits at the bottom of the screen. In the second part of the app, we are going to see something completely different, much more useful, something that you’ll be able to take it and use it in your projects if you’d like. We are going to create a sidebar menu, which will be shown simply by making a swipe gesture with your finger from left to right, occupying just a portion of the screen at the left side of it, and it will be closed by dragging from the menu’s right side towards left. 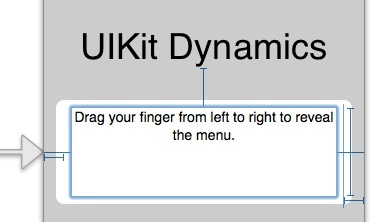 By using the UIKit Dynamics library, we’ll let it appear and disappear in a more realistic fashion, as you see in the following image. Nothing is going to happen when tapping on menu options, as we only care about the way the menu gets showed up and hidden. Note that we won’t implement the menu as a new view controller, but we’ll add it as a subview to the second tab view controller’s view. The use of an extra view controller would make us fall into a completely different case, the so-called custom transitions, which is not my goal, but it could be the topic of another tutorial. In case you want to implement something similar to your apps, it’s up to you to either use a simple view like we’re going to do here, or a new view controller. At the end, the way the menu view will appear, remains the same. So, after having taken a rough idea about our demo app, let’s start working on it. If you haven’t ever worked with UIKit Dynamics, I’m confident that you’ll be amazed by how easy and fast it is to use physicality in your apps. Click Next to proceed. 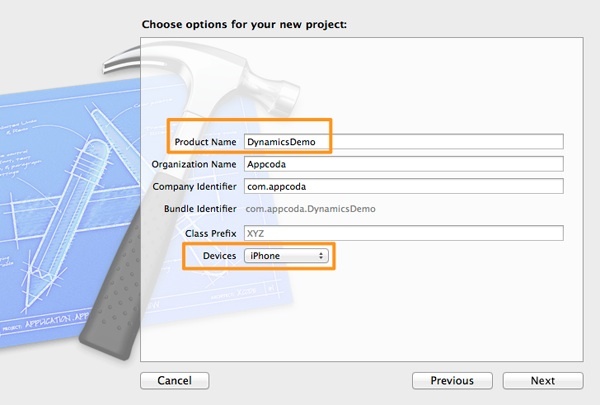 In the second step, set the DynamicsDemo in the Product Name field, or pick any other name you would like for the demo app. Also, make sure that in the Devices drop down menu, the iPhone value is selected. Leave the rest as it is, and click Next again to be navigated to the last step of the guide. In this window, just select a place on your disk to save the project, and click on the Create button. The project is ready. Now that our project is ready, we can see very quickly and easily the first effect of the UIKit Dynamics, the gravity. As I already said in the app overview section, we are going to use a UIView object with a round shape, making it look like a ball, in which we’ll attach the gravity behavior. However, before we manage to do so, some preparational steps are required to be done first. 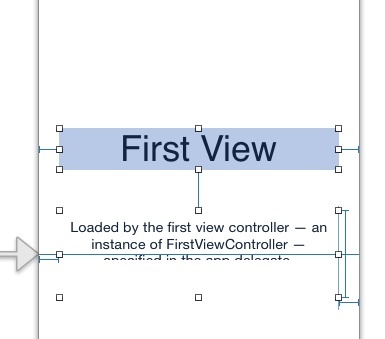 So, being on Xcode, begin by opening the Main.storyboard file and let your interface appear on the Interface Builder. Once it shows up, go to the First View Controller scene and then select and delete the pre-made contents. We want it to be totally clear. Next, double click on the bar button item title at the tab bar area, and rename it from First to Ball. You see that the first object we declare is an UIDynamicAnimator object, which will be used to perform all the UIKit Dynamics animations. As I said on the beginning, it’s not going to work on its own, but don’t worry yet. We are going to add the gravity behavior to it in a while. Next, we declare a UIView object, named orangeBall that will represent the rounded view that we’ll create right after, and as you conclude from its name, it’s going to be… orange. Now, head to the viewDidLoad method to initialize these two objects. // Setup the ball view. Regarding the animator initialization, you see that it needs a reference view in which is going to work. In our case, this view is our default one. In the first line we initialize an UIGravityBehavior object, which it accepts upon the initializations a NSArray object containing all views that the gravity effect will be applied to. In our case, the only such view is the orangeBall, but if we had more views that we’d like to gain gravity, we would add them here. Anyway, you see that initializing a gravity behavior is quite simple. The next step is necessary if we want to see it working. Further than simply creating the behavior, we must also add it to the animator, therefore we use the addBehavior method of the animator object to do so. Congratulations! Your first UIKit Dynamics effect is perfectly working! If we didn’t add the gravity behavior to the ball view, it would remain still at the 100, 100 point of the screen. Now, the gravity is taking it down, and even you don’t see it, the ball view continues to “fall” outside the visible area of the screen. Let me give you a tip on how you can check this. As you see, we assign a block directly to the action property of the gravity behavior. Then, with a simple NSLog command we display the center-y point of ball view to the debugger. Once you run it, you should see an increasing float number that represents the ball position. You’ll find out that it won’t stop on its own, so stop the execution through Xcode. So, we’ve managed to create and add a gravity behavior to the orange ball view, however simply making it fall endlessly due to gravity is totally pointless. It would be much more interesting if we could make our ball bounce and finally rest when it hits the top side of the tab bar , just like a real ball on the floor. Once again, upon initialization we specify the orangeBall as the item that this behavior will be applied to. The addBoundaryWithIdentifier:fromPoint:toPoint: method is used to define a custom boundary, which you can imagine as an invisible line from point to point specified in the way shown above. Great, we’ve created a collision behavior and our ball view doesn’t get lost in chaos, however the bouncing doesn’t say much yet. We can fix this by changing the elasticity of the collision, but how can this be done? Now that we’ve met the UIDynamicItemBehavior class and the way it works, you may try out more properties that can affect the ball movement. So, why don’t you add the to the code above the resistance or the friction properties as well and play around with their values (0.0 to 1.0)? You see that when the ball view rests, it permanently turns to blue, meaning that the collision has not ended. That’s normal, as the ball just sits on the boundary we have set. Anyway, now that you’ve tested the UICollisionBehaviorDelegate protocol, you may comment out the color changing lines if you wish, so the orangeBall remains orange. Note that in the two delegate methods demonstrated above the example that was given was quite simple. In real applications, you might want to take advantage of the parameter values given from the methods and perform more advanced tasks. For our purpose though, what we’ve done here it’s just fine. So far so good! We have done a great introduction to the UIKit Dynamics aspects by using the gravity behavior, the collision behavior and by modifying properties with the UIDynamicItemBehavior class. We also saw how we can use the collision delegate methods, and generally we took a nice taste of the library. However, just “dropping” a ball view from a point and watching it bounce is quite simple, so let’s go to make our example more complex by adding more views to it. Run the application now if you want to see how the obstacles have been positioned. Don’t mind the ball view, you’ll just see it staying still at its original point. We’ll fix that right next. With that small modification, the starting point of the ball will be a little bit higher than the first obstacle at the left. Run the app if you want to see what the new initial position is. Well, here’s the deal. Just as we previously did, we will attach a gravity behavior to the ball, so it can move towards bottom when it starts its course. However, the new clue here is that we are going to give it a little push by adding a UIDynamicPushBehavior object to the animator. The push will not take place upon the app running, but when a touch will be made to the view, so we can have greater control over the whole process. So, having said all that, let’s return to the implementation of the playWithBall method. … makes our main view’s bounds work as boundaries for the items that will collide. In our case, just the ball view and the third obstacle can “hit” the view’s bounds. Anyway, that’s necessary to be done, if we don’t want our views to get lost to the invisible area of the view. … dictates that all edges of items that participate to a collision will have the desired behavior. Guess what? We’re just a step away from running the app and watch everything in action. One last step has been left, to implement the push behavior when a touch occurs on the screen. Before we implement it, go to the private interface section and declare a private BOOL property that will indicate whether the ball is rolling or not. If the ball view is not yet moving, then we create a push behavior object specifying the ball as the item that will be pushed. In the mode parameter we set the UIPushBehaviorModeInstantaneous value, telling it that way that we want our ball to get its max speed from the beginning and not gradually. The magnitude property actually defines the speed of the ball view. There is also the angle property, which can be used to define the direction of the push. This behavior, as any other, is finally added to the animator. You may now run the app. When you perform a touch on the screen, the ball is pushed to the right and its course begins. In combination with the gravity and the collision behaviors, its movement will be totally natural. 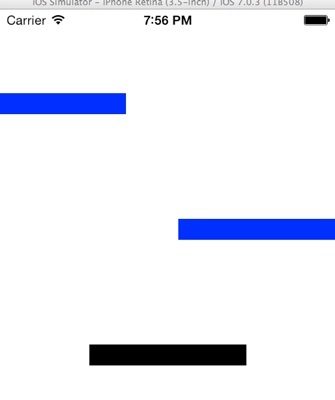 Our previous work can be evolved even more and turn into a kind of a pong game, if we add a paddle at the bottom side of the screen (right above the tab bar), which will be able to be moved around with our finger (or the mouse in Simulator). The code additions and modifications we must do are few, so let’s get started. At first, go to the private interface section and declare a new UIView object that will represent the paddle. We do that because we want it to be privately visible to the class, as it’s going to be used in more than one methods. Besides that, declare a CGPoint property that will be used to store the initial paddle center point. You’ll see how this can become handy in a while. The only noteworthy here is that we store to the paddleCenterPoint property the initial paddle center point. The rest of the commands are quite easy. Launch the app now and see that the paddle view has been added. It’s there, however it cannot be moved yet. So, let’s see how we’ll do that. Here you can clearly see the purpose of the paddleCenterPoint property. As I said, we want the paddle to have a constant value on the y-axis, and that property is where we take if from. Moreover, the new center point of the paddle is composed by the x-point of the touch location, and the y-point of the initial paddle center. The new center is set to the paddle, so it is moved according to our commands. Finally, and that’s really important, nothing is going to happen visually without the invocation of the updateItemUsingCurrentState method of the animator. This one updates the visual state of the item been given as an argument, and make sure to always call it in your own projects when making visual updates. Okay, the paddle is ready and it moves according to our finger’s (or pointer’s) direction, and you can test it now if you want. However, how about to give some extra push to the ball when it collides to the paddle? That would give it some extra acceleration that would eventually lead to better effects. Previously, when we first saw the collision behavior, we also talked about the UICollisionBehaviorDelegate protocol and we implemented a couple of its delegate methods. Here, we need to implement one more such method, and in there to create a push behavior that will be added to the animator. The following code fragment shows the delegate method that is called when two dynamic items collide (the ball view and the paddle view). Every time that a new collision begins between these two views, a new push behavior is created that accelerates the ball view even more. The condition above is necessary so we are sure that the collision regards the ball and the paddle views. Running the app now, you’ll see that the ball gets an extra push after each contact with the paddle. All the work we previously did over the last sections gave us an opportunity to get familiarized with the UIKit Dynamic concepts, but it’s obvious that besides the teaching purpose, the bouncing ball view is not going to be useful to anyone’s project. 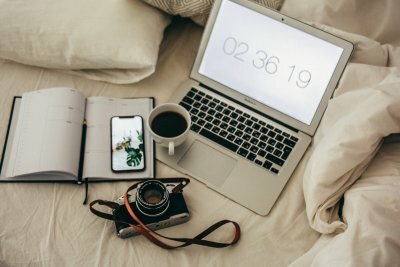 Therefore, I think is quite important to create something that you can take with you when you finish this tutorial, something that will be both useful and reusable. Of course, none of the menu options is going to work, as we only care about the show/hide functionality. It might look somehow difficult to be done, but don’t worry, it’s an easily doable task as you’ll finally find out. Before we begin working, let me make a clarification. The solution we’re going to implement here won’t use any extra view controller, but only UIView objects in the class we’re already working on, and it best suits in cases where you want to present a menu with options to a single view controller. For app-wide menus, you should better create a new view controller (both the class and in storyboard) to implement the menu, so you can access it from other various view controllers. I’m not going to do it that way, because this is actually the implementation of custom view controller transitions, and it’s totally out of my purpose. So, keep that in mind if you’re planning to do something similar to what we’ll do next to any of your projects. So, let’s get started with all these, as we have a small journey ahead of us. The couple of steps described here regarding the Interface Builder are optional, so follow if only you want, otherwise keep reading after this part. Begin by opening the Main.storyboard file, and by going directly to the Second View Controller scene. Instead of deleting the existing contents, you may edit them and write your own messages, or just leave them as they are. The next figure shows a sample of what I wrote the the existing contents. As you understand, this one defines the width of our menu. Feel free to change it if you want. // Setup the background view. // Setup the menu view. // Setup the table view. Now, let’s go back to the SecondViewController.m file, and let’s implement all the minimum required delegate and datasource table view methods. I’ll give you them all in once, as they’re pretty easy. You’ll see that the table view contains five rows, each one matching to an option, and when tapping on any of them, the selection simply gets removed from the selected row. Let’s focus our attention now on how we can make the menu view show and hide from the main view. If we think a moment about it, you’ll see that we actually desire the same animated movement to take place when either the menu view appears on the screen or it goes away, with just one difference, the direction. That means that the dynamic behaviors that define the animation could be implemented in one method only, where depending on the desired state of the menu view, all direction-related properties could get their values on the fly. The shouldOpenMenu parameter specifies whether the menu should open or close. Before we implement it, let’s see for a while what kind of dynamic behaviors we are going to need for showing the menu view. First of all, we need a collision behavior in order to make it stop to an invisible boundary and not to travel from edge to edge in the screen. Next, we want a gravity behavior with direction to the right, so the menu view looks like it’s pulled by the boundary we set. These two, along with a UIDynamicItemBehavior object for setting the collision elasticity are fine, but we could also add a push behavior so our menu view moves a little bit faster. We’ll use the exact same behaviors to close the menu towards the opposite direction. In the implementation that follows right next, at the beginning of the method you’ll see all three values that depend on the shouldOpenMenu parameter flag. Each behavior setup is simple enough, and according to what we’ve seen up to now, it’s easy to be understood by anyone. Just a couple of notes: Firstly, notice that at the beginning of the method we remove any previous behaviors from the animator. We need to do that because when we’ll perform the opposite gesture to hide the menu, new behaviors will be added to the animator and some of them (such as the gravity behavior) must exist only once in the behaviors collection of the animator. At second, the transparency of the background view is also dynamically specified depending on the menu state. Well, now that the most important method of this part of the tutorial is ready, let’s see how it can be used. I have already said that by making swipe gesture to the right in the main view, the menu must appear. With a swipe gesture to the left in the menu view, it must disappear. The easiest and most wise thing we can do, is to invoke the same method when each one of these gestures is made, and then depending on the gesture direction to call the toggleMenu: method with the appropriate argument value. Let’s see that in action. There are two differences in these two code segments: The first is the direction of the gesture. The second is the view that each gesture is added to. Notice that in the second case, the swipe gesture to the left is added to the menu view. Then, let’s implement it. You’ll see in just a second that depending on the direction property of the gesture parameter object, we call the toggleMenu: method specifying the appropriate argument value. Now you can run the app. Test the menu and feel free to play around by changing various property values. Further than that, try to create some effects on your own that you would like to see. UIKit Dynamics is a pretty useful library that can give life to application. Taking advantage of the provided behaviors and setting the appropriate values to various properties, cool effects can be created that fit to any application ecosystem. Keep in mind that you can always make effect combinations, however be aware that sometimes you may end up with conflicts. Through this tutorial an effort was made to present the UIKit Dynamics basics and its most essential concepts. It’s now up to all of you to work on it even more, and to implement natural effects that will make your applications more attractive. I hope I gave you some good food for thought and practice, and until next time, keep playing some… ball. For your complete reference, you can download the complete Xcode project from here. What do you think about this tutorial? Feel free to leave us comment and share your thought. Just that I needed, THANKS!!! I know I’m answering quite late, but better than never I guess. Well, first of all, you could try what priya suggests in his answer, which I think that will do what you want. A. Add the collisionBehavior.translatesReferenceBoundsIntoBoundary = YES; which turns the reference view’s bounds (self.view bounds) into boundaries. B. If the above won’t work for a reason (I noticed that it’s possible sometimes the paddle to go off-view), then do the following: Add two UIView objects (left and right) and make sure that they’re not visible, but the right edge of the left view and the left edge of the right view are on the main view’s boundaries (imagine them as walls). Then create a dynamic item behavior for those two views and set their density property to a very high value, so they become quite heavy and hard to be moved. This is actually a workaround, but it hope it works. You are simple awesome! Thank you! Very cool tutorial. Thank you. – I found a problem in the menu where if you select from the table, the swipe gesture no longer works. Any idea on how to fix this? Could you please provide me with exact details about that? I gave it another try today and it works fine to me. Do you perform any combination of taps/clicks? Let me know if you figured it out. Thank you. This was really great. Thank you. This is great tutorial. It was great helpful to me as a start up in new animations. Thanks a lot. I have a very basic question here, am new to iOS, please bear with me. How can I find the “addBoundaryWithIdentifier:@”tabbar”” – this property of UILabel view which I designed using storyboard. Answer will be much help full to me. Thanks for such an informative tut on animations. Hi, great tutorial. Thanks for the efforts that have gone into making this. Thanks for this wonderful tutorial! I was able to create some awesome Animated screens! You are using a circle button and a rounded panel, yet they are treated square by the dynamics, so bounce when they are not touching. So my question is, what do we have to change about the code to make it collide based on the actual shape? That is a great tutorial, thank you very much for creating it! 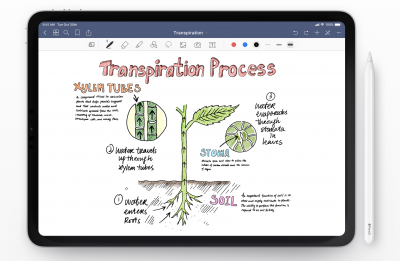 I have a question: when it comes to create some serious application with good animation… What is the common used classes to make shapes and animate them ? Thanks for the tutorial..but I am getting an exception ..
‘NSInvalidArgumentException’, reason: ‘*** -[__NSPlaceholderArray initWithObjects:count:]: attempt to insert nil object from objects’.